You don’t hear much about PacNor barrels in long-range competition, but FORUM member Wes J (aka P1ZombieKiller), proved that they can shoot “lights-out” in a rig assembled by a talented gunsmith. 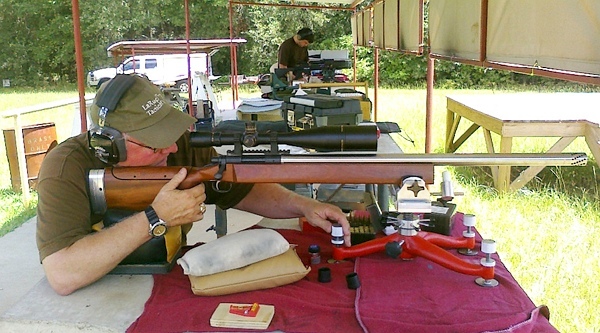 A few seasons back, Wes decided to upgrade a 6mmBR for mid-range benchrest and varmint matches. Wes tells us: “Since I restocked my 6BR … I have not had a chance to shoot it much since I have been playing the 100-200 game. I decided to take it out and do some playing at 500 yards. I have to give some serious props to my buddy (and fellow FORUM member) ‘PREACHER’ who did the chambering and barrel work for me. He can certainly make a gun shoot good. The barrel is a PacNor 1:8″ twist. My load was 105gr Berger VLDs pushed by 29.6 grains of Varget.” The five-round, 500-yard group shot by Wes J with his 6BR, measured just 1.240″, as measured by OnTarget software. Now that’s one accurate rig! This Editor knows something about the potential of a PacNor barrel. I have a 3-groove stainless PacNor SuperMatch on a Savage-actioned 6BR. This barrel shoots honest quarter-MOA in calm conditions, and it cleans up super-easy. The interior finish is so good, I’ve never had to brush the bore or use abrasives, and after 750 rounds it shoots as well as ever. I attribute the easy cleaning to the fact the lands in a PacNor 3-groove are wide and flat, so they are gentle on bullet jackets. I think accuracy is helped by the fact that my PacNor runs on the tight side (0.236 land dimension) with a good amount of choke. That works well with the 105gr Lapua Scenars and 103gr Spencers I like to shoot. You can read more about my rifle, nick-named the “Poor Man’s Hammer”, in this Feature Article from our archives. On one particularly calm day, in the hands of my friend (and ace trigger-puller) Joe Friedrich, the Poor Mans’ Hammer put 3 shots in under 0.200″ (measured center to center) at TWO Hundred yards. If you get a good one, PacNor three-grooves can definitely shoot. 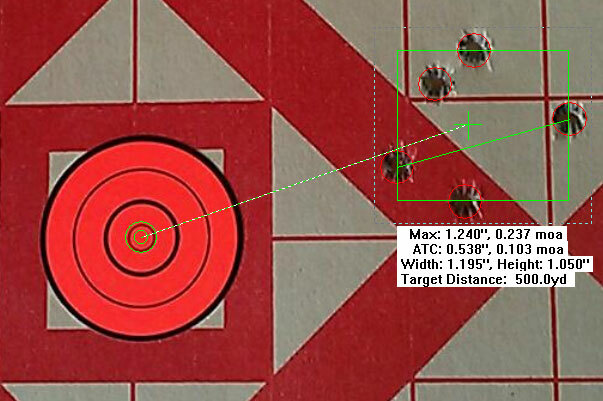 We used OnTarget software to measure the 5-shot group in the target above. This easy-to-use software is very repeatable, once you get a feel for plotting the shots. The latest On Target v2.25 Precision Calculator is FREE for a 15-day evaluation period. If you like it (and you will, trust us) there’s a modest $11.99 registration fee to activate the program. In addition to group size (in inches), OnTarget plots distance to aiming point, and the software automatically calculates the group’s vertical height, horizontal dispersion, average to center (ATC), and group size in MOA. You can run a measurement on a scanned target or a photo of a target. You’ll need some known reference to set the scale correctly. The target above had a one-inch grid so it was easy to set the scale. Once you’ve set the scale and selected bullet diameter and target distance, you simply position the small circles over each bullet hole and the OnTarget software calculates everything automatically, displaying the data in a data box superimposed over the target image. 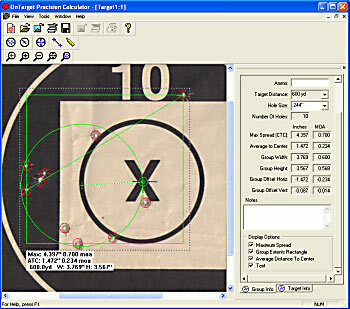 To learn more about OnTarget Software, read AccurateShooter.com’s OnTarget Product Review. This article covers all the basics as well as some advanced “power user” tips. NOTE: Since the review was written, On Target has updated the software, and the free version now has a time limit. Share the post "PacNor Barrels Can Shoot — 1.240″ Group at 500 Yards Is Proof"
Jeffrey Block has created a great FREE software program, OnTarget, that measures shot groups quickly and precisely. All you need is a photo or scan of your target. The program allows you to set your target distance, and provides caliber-specific tools to precisely mark the center of each shot. Once you’ve marked each bullet hole, Jeff’s OnTarget program automatically calculates group center, maximum group spread (CTC), average distance to center, group width and height, and group offset from point of aim. The program will even measure multiple groups on the same target. Jeff created an excellent Animated Tutorial demonstrating OnTarget’s functions. 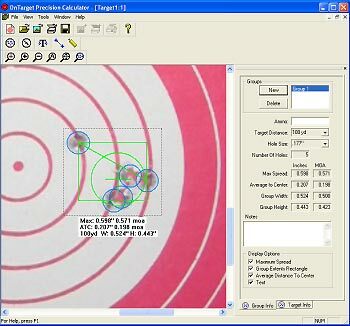 It shows how to import a target image or scan, how to set target distance and scale, how to set bullet size, how to circle each bullet hole, and how to save the marked and measured target. VIEW OnTarget TUTORIAL. After just a few minutes spent learning the program’s tool buttons, we were able to plot shot groups on a variety of targets with ease. 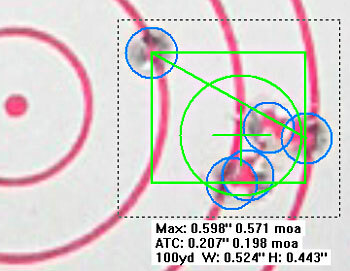 Once you select the target distance and bullet diameter, figuring group size is a simple matter of centering a circle tool over each bullet hole. Then the program “connects the dots” and provides all the info you could want automatically. The program worked with bullet holes as small as 17 caliber and as large as 50 caliber. It is very precise, but remember that if your target photo was taken at an angle, distorted perspective can cause slight errors in measurement. Therefore, for the ultimate precision, you want to start with a flat scan of the target. We found OnTarget to be especially useful for groups with widely dispersed bullet holes, or very small bullet holes, such as 17 caliber holes. We’ve found that it’s difficult to measure 17-cal group sizes with a standard caliper, because the tool itself obscures the tiny holes. 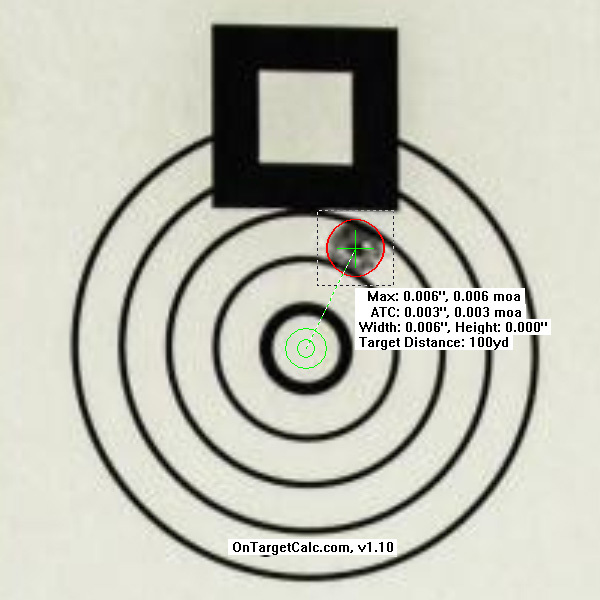 With OnTarget, the program can zoom up your target view, making it much easier to plot the center of each shot. And with a widely dispersed group of shots, the program automatically finds the two most distant shots. You can’t mistakenly pick the wrong pair of shots to measure. Here’s another target, showing 6mm bullet holes at 600 yards. 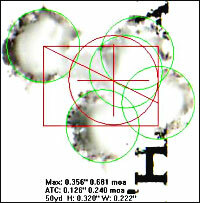 The first image shows the target image loaded into the program with the ten holes circled in red. For this target we have used the Aiming Point option. 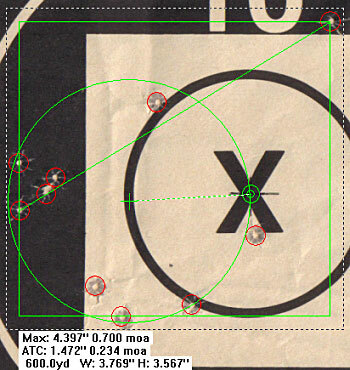 The Aim Point was set at the center of the “X” and the program calculates average distance from the Aim Point. Very cool. Jeffrey Block has done a great service for shooters by creating the FREE OnTarget program. It is easy to learn, it functions great, and it can save you time and effort measuring targets. It also lets you easily archive and compare multiple targets produced during load development or rifle testing. You can record ammo type, date, location, weather etc. in note fields accessed by “Group Info” and “Target Info” tabs. Keep in mind that OnTarget was NOT created to replace existing methods for scoring competition targets. But for all other target measuring purposes it does a great job. Visit Jeff’s website, OnTargetShooting.com, view the tutorial, and check out OnTarget for yourselves. To learn more about OnTarget, see more measuring samples, and read advanced Power-User Tips, visit our full OnTarget Product Review. Share the post "Measure Your Groups Precisely with OnTarget Software"
Below is a larger-than-life-size view. Using this photo we measured the group with target-calculating software, and it came out .006″ (the software only goes to three digits). We recognize that it would be much better to work from the real target rather than a photo, so we are not challenging the official measurement in the least. But this does confirm that this is a phenomenally small five-shot group. Many folks have asked about the gun and ammo that produced the .0077″ group. The Light Varmint-class Benchrest rifle was chambered as a .30-caliber wildcat, the 30 Stewart, which is based on the 6.5 Grendel case necked up. 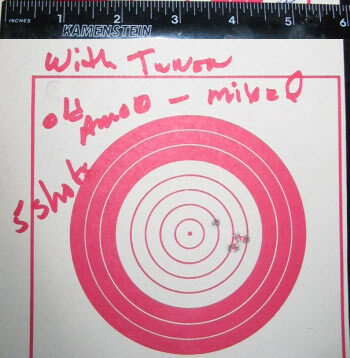 Mike was using Hodgdon H4198 powder behind BIB 114gr, 10-ogive bullets. Notably, the record-setting ammo was pre-loaded before the match. Here is Mike’s tuner-equipped rifle. CLICK HERE for more information on the rifle and cartridge. 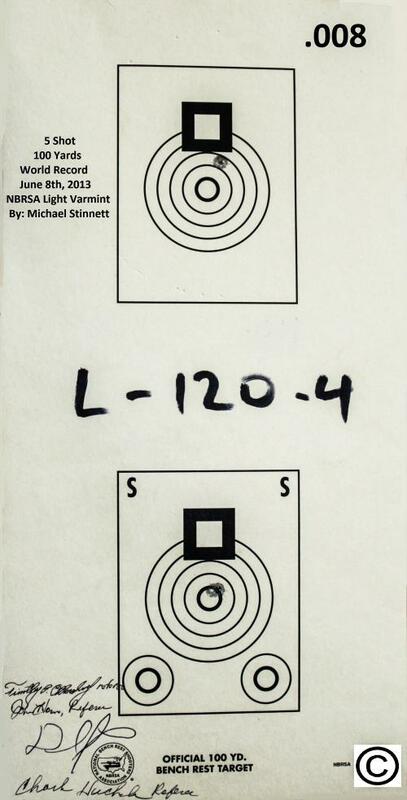 Share the post "Best Group Ever: Michael Stinnett’s .0077″ Five-Shot Group"
Jeffrey Block has created a great new FREE software program, OnTarget, that measures shot groups quickly and precisely. All you need is a photo or scan of your target. The program allows you to set your target distance, and provides caliber-specific tools to precisely mark the center of each shot. Once you’ve marked each bullet hole, Jeff’s OnTarget program automatically calculates group center, maximum group spread (CTC), average distance to center, group width and height, and group offset from point of aim. The program will even measure multiple groups on the same target. Share the post "OnTarget Software Measures Group Sizes from Scan or Photo"